INDIANAPOLIS -- The daily grind of the 82-game regular season was spent for this moment. You know, the kind where the Indiana Pacers dominate on their home court and take another step toward eliminating those pesky Atlanta Hawks in their march toward a rematch against the Miami Heat in the Eastern Conference finals. The Hawks, as they've done all series, fought and didn't back down from the Pacers. They were the aggressors by dictating how the game would be played. The Pacers? They took a shot and didn't fight back until it was too late for them. Now, as hard as it is to imagine when you consider how they were the feel-good story in early January, the Pacers have backed themselves into the position of being at risk of completing one of the biggest collapses in NBA history. Andy Lyons/Getty Images Roy Hibbert was a spectator for much of the Game 5 loss to the Hawks. The Hawks easily beat Indiana 107-97 to take a 3-2 best-of-seven lead. Atlanta can put the Pacers in the same category as the 2011 San Antonio Spurs and 2007 Dallas Mavericks -- No. 1 seed losing to a No. 8 seed -- with a victory on Thursday. "Fighting for [our] lives, it's disappointing," Pacers forward David West said. "We're frustrated. Our team has definitely not played the way we know we're capable of." The Pacers have nobody to blame for themselves for being in this position. They're the ones who spent the season publicly craving the No. 1 seed. They got ahead of the pack and became full of themselves, no longer with the same passion. They've continued to prove they're not mentally tough enough to handle success and not capable of handling adversity. That's why they're trailing the series, and that's why players sat emotionless inside the locker room with dejected looks on their faces following their second home loss of the series. This is supposed to be a time when the Pacers become tighter than ever. Instead, Paul George was talking about Hawks forward Paul Millsap attempting more free throws than West. That's not mental toughness. That's giving excuses for getting outworked. "The only thing that matters now is Game 6," Pacers point guard George Hill said. "Game 5, we let it slip away on our home court. Now, it's really a must-win for us for Game 6. We have to continue to fight and believe in each other and focus and trust each other." All it took was a second-quarter shooting display by Hawks forward Mike Scott similar to what Reggie Miller would occasionally have during his 18-year career in Indiana to cause the Pacers to go from believing in themselves to ceasing to fight until the fourth quarter. Scott scored 17 points -- 15 on 3-pointers -- on a perfect 6-of-6 shooting to lead a 41-point second quarter in which the Hawks outscored the Pacers by 22 points. "If you could explain it, you would bottle it up," Hawks coach Mike Budenholzer said. "I think it helps when you see the ball go in the basket on your first shot. He's somebody that we have a lot of trust in, a lot of confidence in." The lack of defensive adjustments had some Pacers frustrated. "We have to be able to make better adjustments," West said. "We just didn't respond. I have no explanation on why we gave up 40-something [points] in the second quarter. "Coach [Frank Vogel] throws [the starters] back out there and says, 'Get us out of the hole.' Just tough, particularly when a team is rolling, feeling good. We're in an uphill battle the whole game." Vogel is a prideful coach who isn't interested in adjusting his game plan. Budenholzer has one-upped Vogel so many times in the series that the Pacers coach finally stopped being stubborn with his reluctance to use shooter Chris Copeland at power forward in the second half. Copeland brought some life, but the damage had already been done. The Pacers trailed by as many as 30 points, they lost their composure with a couple of technicals and the blue-and-gold faithful booed them in disgust. Here the Indiana Pacers stand, their season on the brink and plenty of doubt about whether they're mentally and physically capable of extending their season at least one more game. "I think when you back a cat in the corner or any animal in the corner, they're going to fight their way out," Hill said. MVP: Manu Ginobili. With Tony Parker struggling mightily, the Argentine carried the Spurs' offense yet again in the first round, scoring 23 points and hitting six of eight shots inside the arc. Manu also had five assists and made eight of 11 free throws for the Spurs. X factor: Boris Diaw. "Bobo" spent time defending Dirk Nowitzki (19 points on 19 shots) with Tiago Splitter in foul trouble and scored 17 points off the bench, including the go-ahead 3-pointer with 32 seconds left. heart-stoppingly fun: San Antonio built a lead that reached 20 points early in the third quarter. In a flash, the Mavs cut it to single digits and set up a back-and-forth affair that went down to the wire, leaving fans to wonder how it would've ended had DeJuan Blair not been ejected for possibly attempting to kick Splitter when the pair got tangled on a foul. MVP: Even in the loss, Paul George did everything to rally his team after it fell behind by 30 points. George's activity was palpable on both sides of the floor, and he finished with an impressive 26 points, 12 rebounds, 6 assists and 6 steals. X factors: Shelvin Mack and Mike Scott, who scored 30 of Atlanta's 41 points in the second quarter. Scott hit five consecutive 3-pointers in that quarter, and Mack ended up with a game-high 20 points by closing out the game in the fourth. LVP: It feels mean to continuously put Roy Hibbert here, but in 12 minutes of play, he had zero points, zero rebounds and four fouls. No further analysis needed. MVP: Voter fatigue and the desire for a fond farewell to the Bobcats means this goes to Kemba Walker, who nearly put Charlotte on his back with 29 points (11-for-15 shooting, 4-for-7 on 3-point shots), five rebounds and five assists. Without him, this would have been over much, much sooner. a fitting eulogy: No one thought the Bobcats stood a chance against the Heat, but it was great to see the Charlotte fans standing down the stretch and cheering on a team that exceeded expectations this season. Charlotte has a bright future going forward into the Hornets era. X factor: In Game 3, Al Jefferson's heart and grit while playing through injury elevated the performances of everyone from Michael Kidd-Gilchrist to Gerald Henderson. With Jefferson in street clothes and without that emotional spark, the Bobcats wilted in the third, and the Heat never looked back. Mike Scott, Hawks: A game-changing, perhaps series-changing performance. Scott scored all 17 of his points during the Hawks' second-quarter run, sinking all five of his 3-point attempts as the Hawks took a 107-97 victory and a stunning 3-2 lead on Indiana. Not bad for a 31 percent shooter from 3-point range in the regular season. 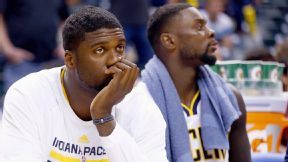 Indiana Pacers: The East's No. 1 seed is now at the elimination stage, having fallen behind the Hawks 3-2. Roy Hibbert finished without a point or rebound for the first time in his playoff career. Indiana was outrebounded for the first time in the series, and its rebuilt bench was outscored 45-23. "This guy has no place in the family of the NBA. Whatever it takes, we have to make sure this kind of event never happens again." -- Rockets owner Leslie Alexander, who would like to see Clippers owner Donald Sterling ousted from the NBA. Ronald Martinez/Getty Images Boris Diaw hit a go-ahead 3-pointer for the last of his 17 points, helping the top-seeded Spurs hold on to beat the Mavericks 93-89 in Game 4 on Monday night to pull even in their first-round playoff series. Paul George is the first player in NBA history with at least 25 points, 10 rebounds, 5 steals and 5 assists in a playoff loss.